Home > Gifts For Her > Dinnerware > Dinnerware Sets > Yellow Wildflower Salad And Dessert Plates Waiting To Be Picked! Yellow Wildflower Salad And Dessert Plates Waiting To Be Picked! Lovely Yellow Wildflower hand painted salad and dessert plates by Clearly Susan hand painted in various shades of yellow compliment any table. 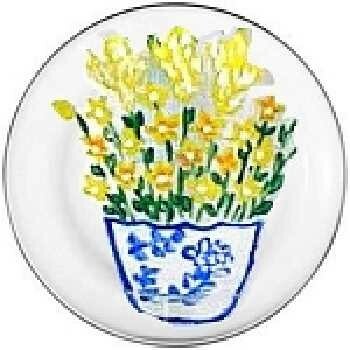 The Yellow Wildflower Design can be used anytime all year long blooming in a blue and white Chinese bowl etched in gold. We offer painted salad and dessert plates or you may order the individual pieces. If you are interested in serving pieces just email me. Yellow Wildflower Dinner Plates Waiting To Be Picked!